The Tripollar laser from Pollogen is a 3rd generation Radio Frequency (RF) laser that is easy to use and very efficient for a busy cosmetic practice. Tripollar treatments results in immediately visible improvements to skin on the body and facial contouring. The results are long lasting, and there’s no surgery or downtime required. Unlike other skin rejuvenation machines, the TriPollar utilizes two different types of heating in one applicator in order to heat multiple layers of skin that are located deep under the surface. By allowing for easy selection of dual-electro heating of fatty areas in the same application, you can easily focus the necessary energy right at the target cells, allowing for heating of all layers of the skin evenly without the need for cooling. The Tripollar laser isn’t just a highly efficient body sculpting and toning tool, but it’s a smart investment as well. This laser machine has a low cost of ownership and doesn’t require any consumables or hidden costs in order to operate. It’s also competitively priced when compared with similar, less powerful machines on the market and is a smart investment for any cosmetic practice. The Tripollar offers the convenience of multiple treatment options in one, easy to operate machine. This aesthetic workstation makes it easy to increase revenue through the delivery of safe, painless and highly effective skin restoration services. Interested in adding the Tripollar laser system to your practice? The Tripollar is the perfect addition to any busy cosmetic practice that wants to expand its service offerings to include the most in-demand anti-aging services. 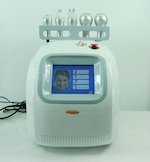 SunrayLaser.com has amazing deals on used Tripollar laser equipment with savings that are up to 60% off the original price! See for yourself how much you can save on high quality used laser equipment when you buy from SunrayLaser.com. Looking for pricing information and other details about our selection of preowned Tripollar machines? Please fill out the form below and we’ll provide a fast and free, no obligation quote. It’s an easy and no-risk way to learn more about this outstanding line of cosmetic lasers.